Each year, Founders Day honors the people who first established Rush University Medical Center as Rush Medical College in 1837. 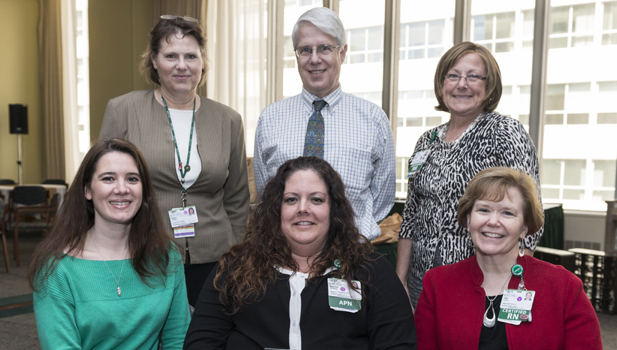 Special awards are presented to employees — including the GlucoseStabilizer Implementation Team — who have played a pivotal role in providing the best possible care for our patients. For the last 10 years, Rush has been focusing on controlling patients’ glucose (blood sugar) levels who were in the critical care units. Achieving the proper levels can be challenging, which is why the GlucoseStabilizer Implementation Team was formed. They implemented a computerized insulin infusion program, resulting in fewer cases of hypoglycemia and patients reaching their glucose level targets faster – all with no operator errors. The national average for how long it takes to get a patient to their target glucose range is six hours. Because of this team’s work, the new system averages only three hours. This team not only managed to come up with a safer, more successful way of controlling a patient’s blood sugar, the team also educated nurses on the new program, created a policy and procedure guide and a nurse pocket card and quick tips. This team collaborated in the true spirit of the I CARE values at Rush, which resulted in improved patient safety. This entry was posted in Founders Day and tagged #rushfoundersday. Bookmark the permalink.